Commercial Christmas & Holiday Decorations | Holiday Lights & Magic, Inc.
WE OFFER OUR HIGHEST DISCOUNTS THE FIRST QUARTER OF THE YEAR - JUST CALL US FOR A QUOTE AND ORDER EARLY TO RECIEVE THE BEST DISCOUNTS AVAILABLE! At Holiday Lights & Magic, Inc. we carry hundreds of commercial holiday decorations to choose from to make your holidays the most wonderful time of the year! We offer commercial holiday decor for residential and commercial use, and pride ourselves on exceeding expectations of creativity, ingenuity and integrity with every project and customer relationship. 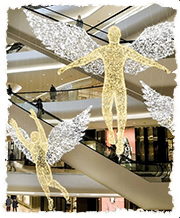 Our in-house designers are known for creating magnificent, eye-catching displays, and we partner with world-renowned companies such as Fotodiastasi to import the finest corporate Christmas decorations available. Buy Your Commercial Holiday Decorations Early! We know how important it is for a business or local government to plan thoroughly for the busy holiday season, so we make it easier to get the commercial holiday decor you need at competitive prices. The earlier you shop at Holiday Lights & Magic, the more you’ll save! We offer our biggest discounts in the first quarter of the year. Whether you’re planning a large-scale display for your town square or decorating your storefronts, festive Christmas displays are just the ticket to draw in customers and bring out the holiday spirit. Shop with Holiday Lights & Magic, Inc. for the very best in custom commercial Christmas decorations.